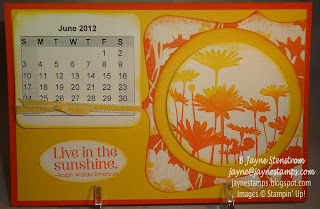 Do you remember a few months ago when I showed you the desktop calendar I made with some friends? You don't? Well, you can go to THIS post to see my first post about it. I also showed some additional months HERE. But then "life" got in the way, and I missed posting the past few months. So I have May, June, and July to show you today. 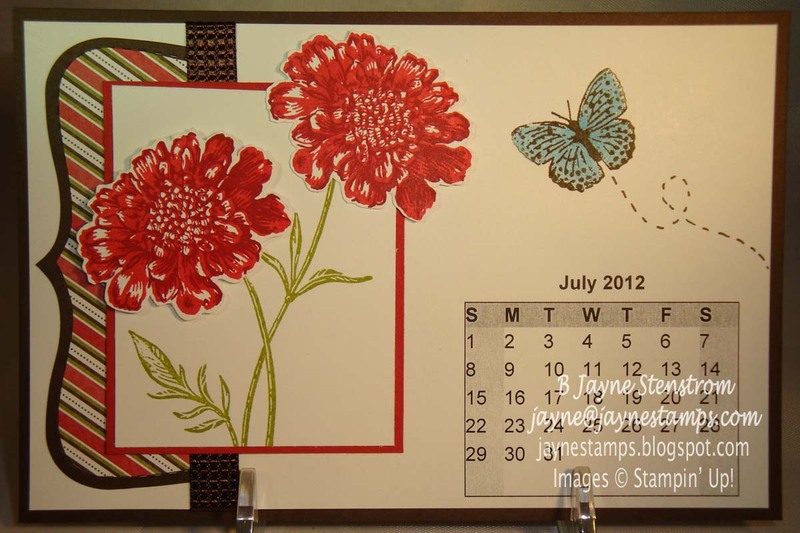 Unfortunately, some of the stamp sets we used to make this back in January have since retired, but you can still use the layout with another stamp set if you want to make a calendar for yourself. 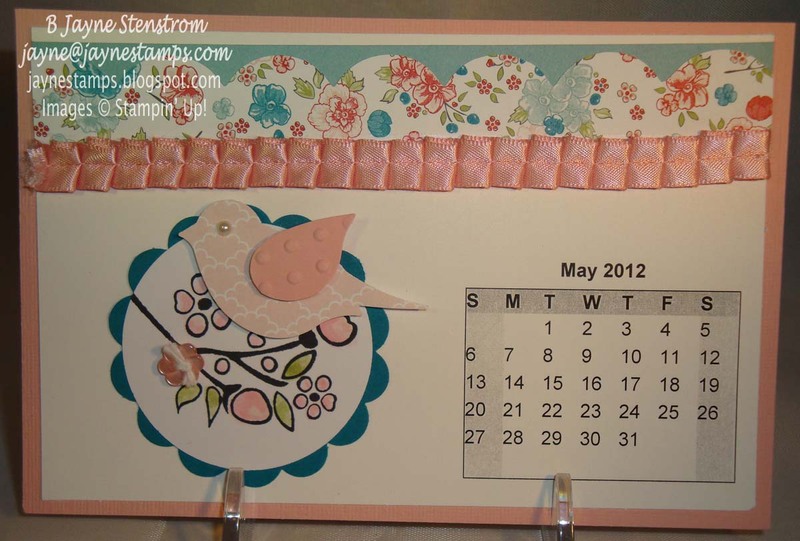 May's design was by Lou Ann C. She used the Bordering on Romance stamp set (pg. 120 of the current IB&C) with Twitterpated DSP (pg. 165 current IB&C) along the top edge. The bird was punched from that paper with the Bird Builder punch. I love the soft look of this page. June's bright and cheery page was created by Cindy W. She used the Upsy Daisy stamp set (now retired) with Daffodil Delight and Pumpkin Pie inks and cardstock. I love how she used the Top Note Bigz Die behind the two circles. It just makes you happy looking at it, doesn't it? 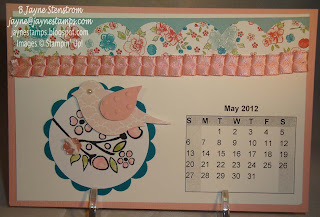 July was my design! We each designed two months - our "birthday" month and one other. January was the other month that I designed (you can see that on the first link above). Usually for July you will see something patriotic because of the 4th, but I wanted to do something a little different. I kept the basic red, white, and blue colors, but I used them in flowers and a butterfly. 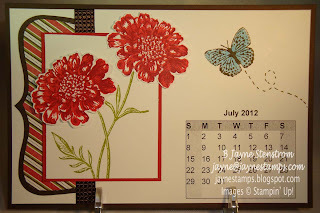 The flowers are from Field Flowers stamp set (pg. 78 IB&C) and the butterfly is from Kindness Matters. The paper is actually from last year's Letters to Santa DSP, which you would normally think of for Christmas, but the angled stripe was perfect for my design. I was pretty pleased with how it came out. Patriotic, but with a twist! I'm really enjoying looking at each month when I "flip" my calendar. I hope we're able to get together and make another one for next year! I love stamping with my friends.